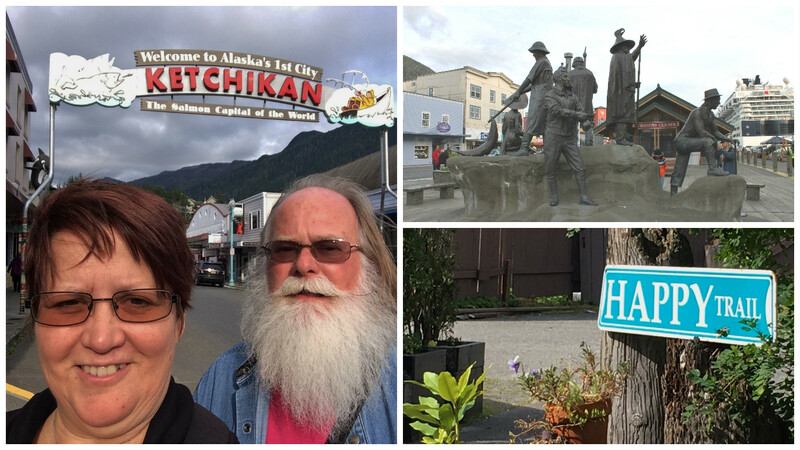 Our Alaskan Adventure started on September 5, 2017. 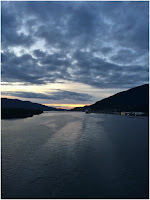 Once we had the RV and Mielikki all settled in at David John and Rebecca's (our nephew and niece-in-law) we headed for the Kingston Ferry. We are so grateful that David John and Rebecca could keep Mielikki for us, we never had to worry about her while we were gone. 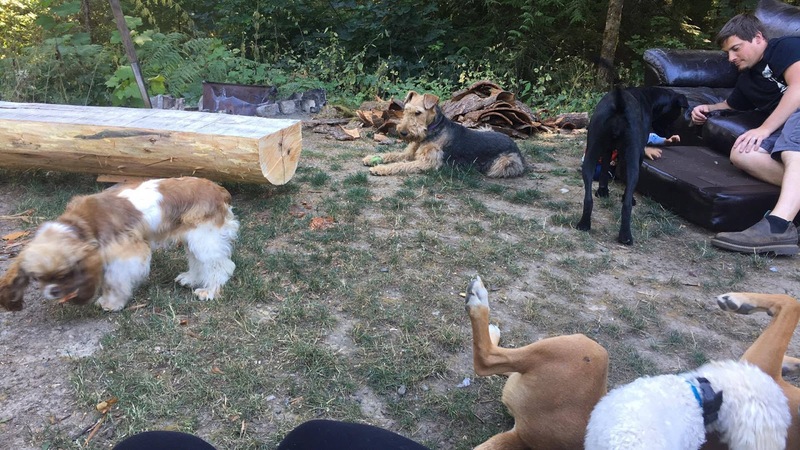 She had playmates, four dogs and a baby, a huge yard to run in and people to love on her. The ferry ride took us to Edmonds, WA where we started the 2 1/2-hour drive to Vancouver, BC. Why Vancouver you ask? Well, we could have flown directly out of Seattle as the plane we took from Vancouver went there but it was $800 more to do that. 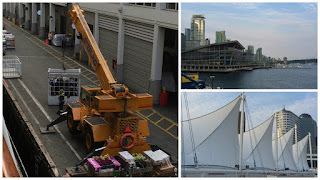 So, we stayed two nights in Vancouver which gave us a chance to explore this cool city and still didn't spend $800! this bird posed nicely for his picture. 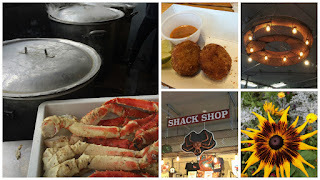 Their Granville Public Market was so much fun. It is in the False Creek just shy of the English Bay with great views of downtown and some interesting bridges. The better part of the day was spent wandering all the shops, having lunch and listening to the street performers. 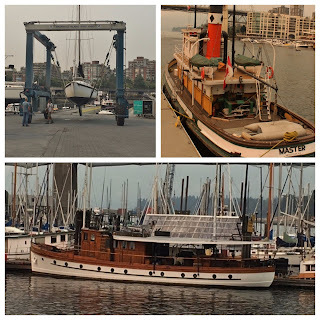 There were some really cool boats to admire as well. 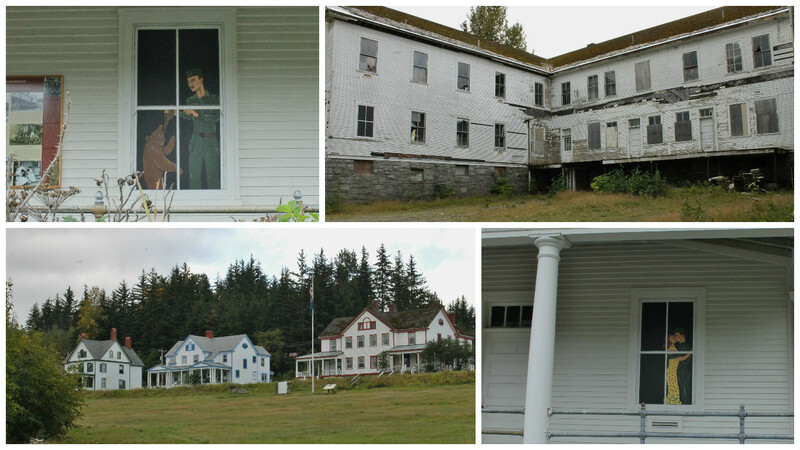 Then we spent the rest of the day in the city where we found some Roadside Oddities. The steam-powered clock sits on a steam grate on a corner in Gastown. 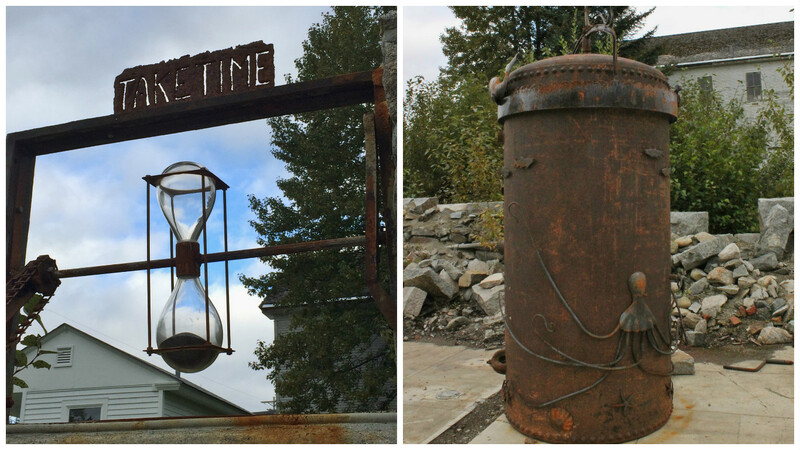 The clock looks old but it was built in 1977 by Raymond Saunders. While it is called "steam-powered" it actually is run by the descending weight system. The steam provides the human winding action. Every quarter hour the clock whistles and shoots steam. There are only six other working Steam Clocks in the world. 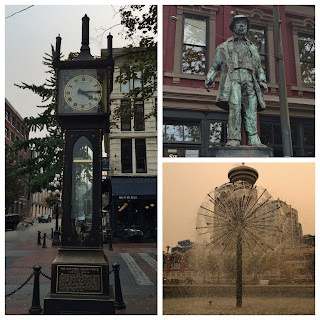 The statue is of "Gassy Jack" the founder of Gastown, and Nancy loved the water fountain that reminded her of a dandelion. 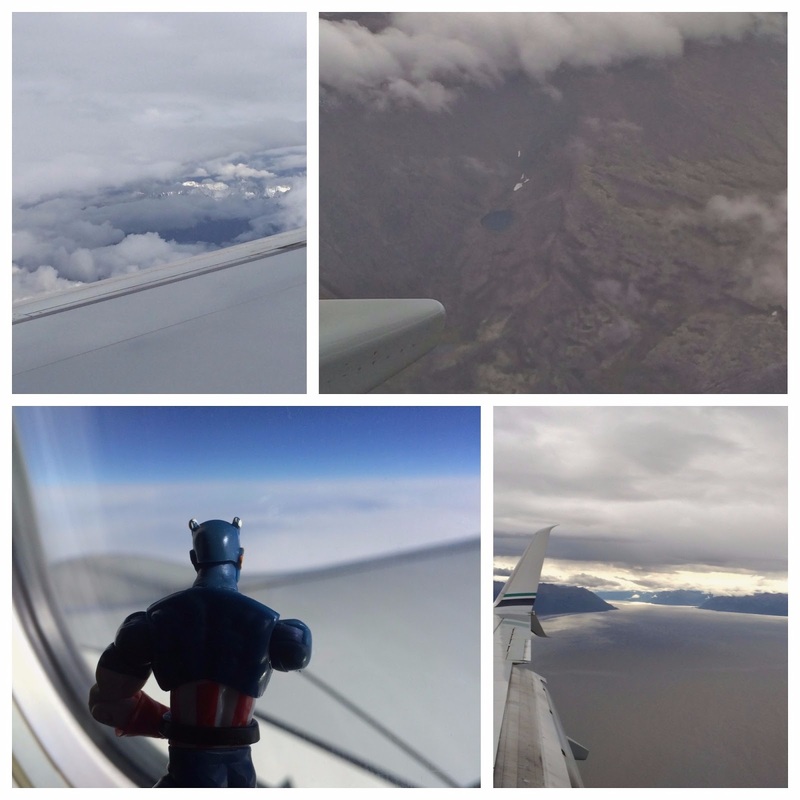 September 7, was a long day of planes, and buses. 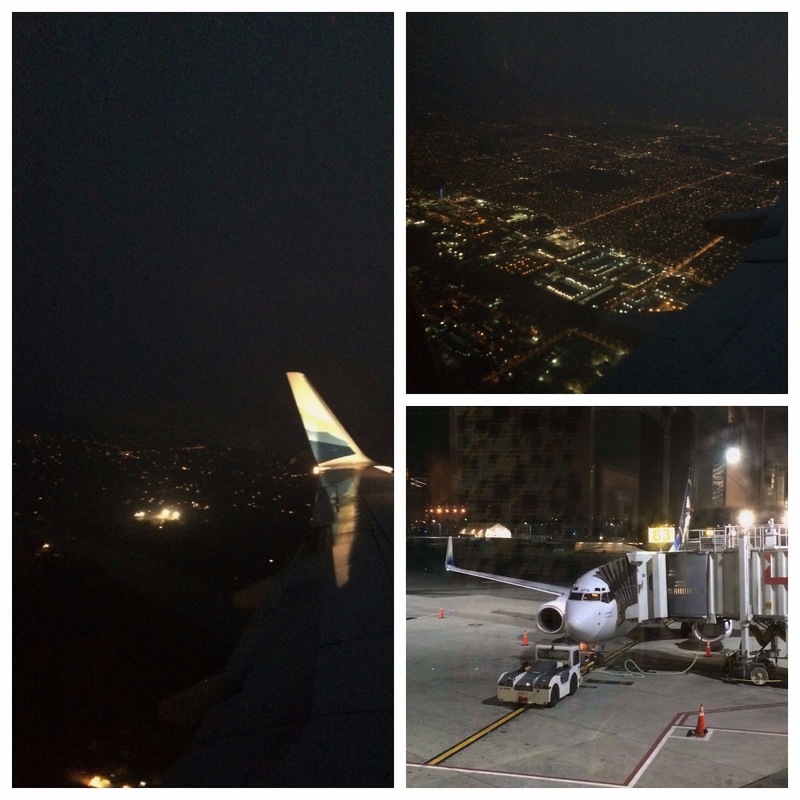 Our 6 am flight out of Vancouver took us to Seattle and gave us some pretty views of the city lights. 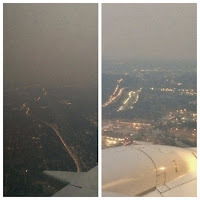 There was lots of smoke in Seattle from the surrounding wild fires. Our hour lay over gave us time for breakfast before we headed to Anchorage. The clouds made it difficult to see much but we did get a few peaks of landscape as we landed. Lunch was on tap in Anchorage as we waited for our final flight to Fairbanks. 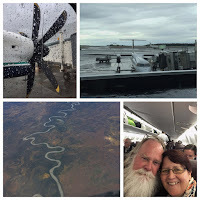 This was a short flight on a small prop plane but it offered some nice views. A short bus ride took us to the Westmark Fairbanks hotel. Arriving mid afternoon gave us a chance to explore town a bit. It is not very big so we were able to walk most of it. 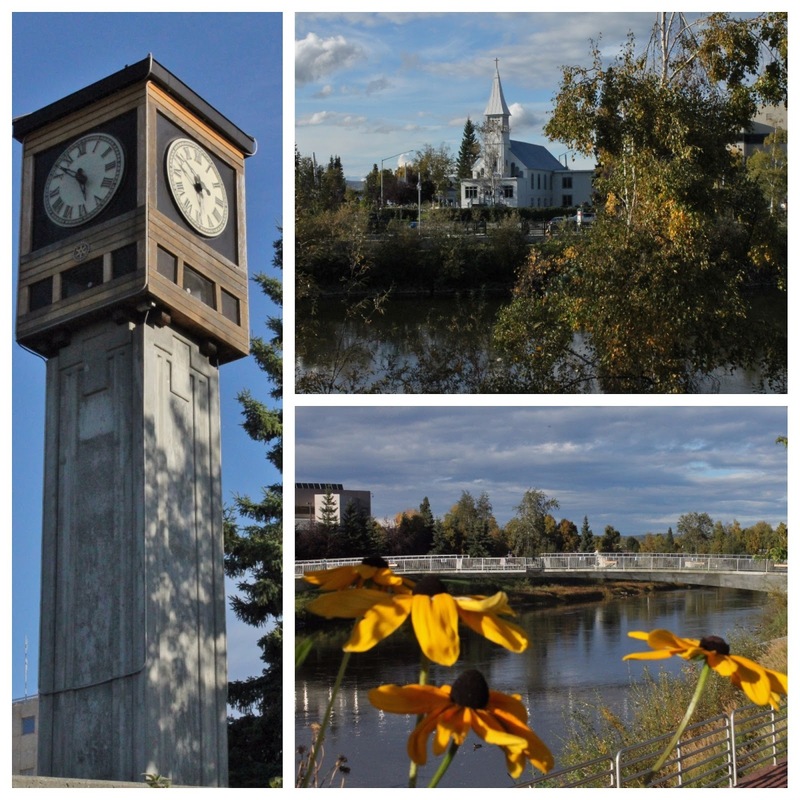 Their city maps says "It's easy to get around downtown Fairbanks. Walk anywhere and back in 20 minutes!" The "Golden Heart Plaza" has plaques and a sculpture that honors the lineage of the families in the area. Each plaque was inscribed with the family line and told the names of each person in the family. It was pretty impressive to see the many family trees. 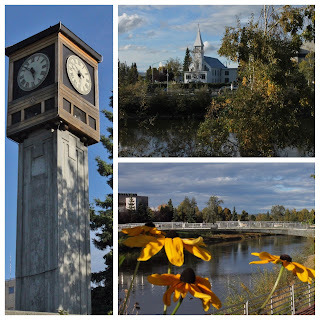 They have a lovely walkway on the Chena River lined with art, history, a chiming clock and a beautiful Antler Arch. 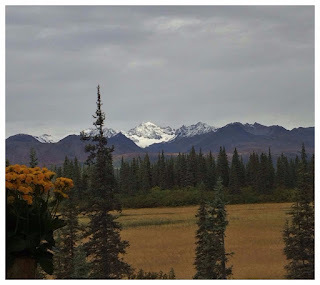 The next morning we boarded a bus that took us to Denali. We stopped about half way on the trip at a small store/coffee shop. 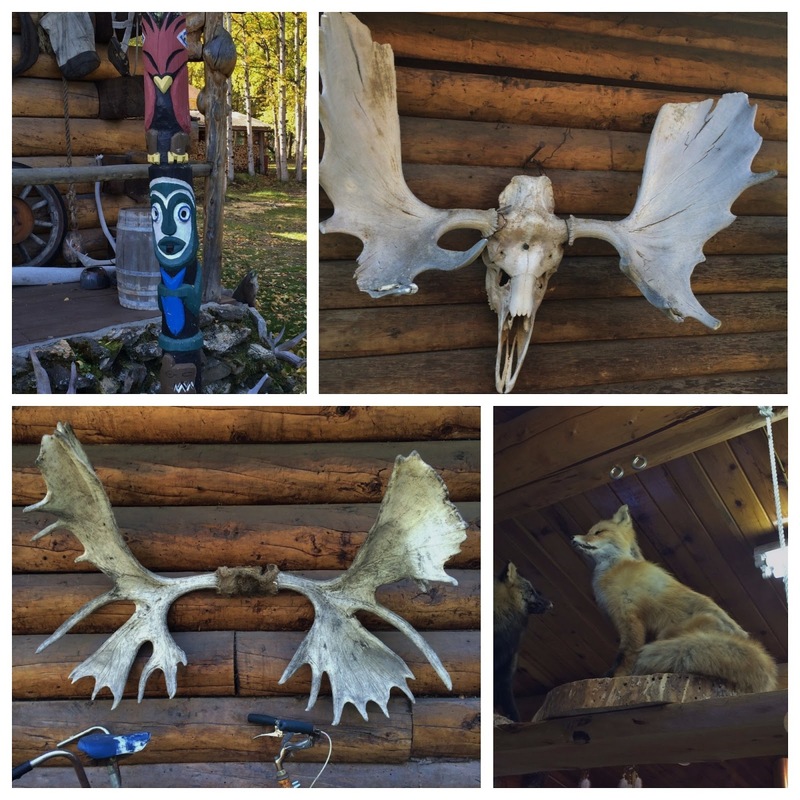 There were lots of moose antlers and stuffed animals including a red fox, that made us think of our friend Anne Fox. 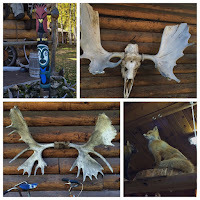 Denali Canyon is a huge complex of hotels and cabins along with numerous places to eat and shop. We spent the night in the McKinley Chalet Resort. 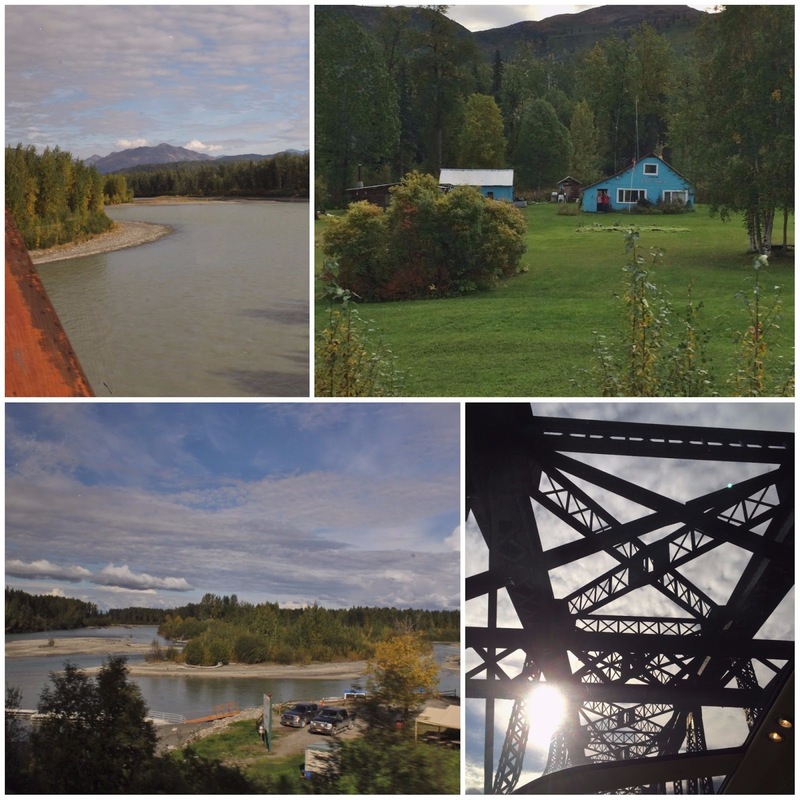 We had a beautiful view from our room and could hear the Nenana River rushing by. We wandered the complex after coming back from the park, ate a little dinner and found some interesting photos to take. 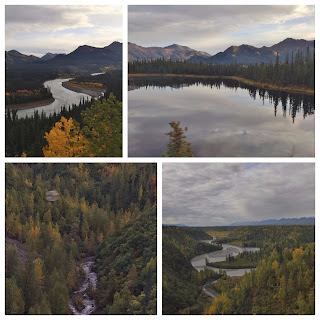 The free shuttle to Denali National Park took us to the Visitor Center where we boarded a park shuttle to Savage River. With only a few hours in the park, we hiked the 2-mile loop trail at this stop. It was a beautiful day, clear skies and lots of sunshine. 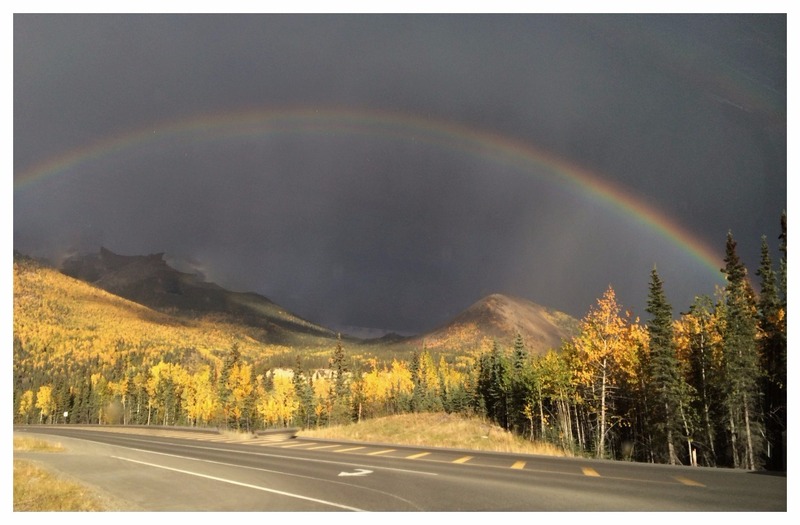 On the bus back to the resort we saw a full rainbow. 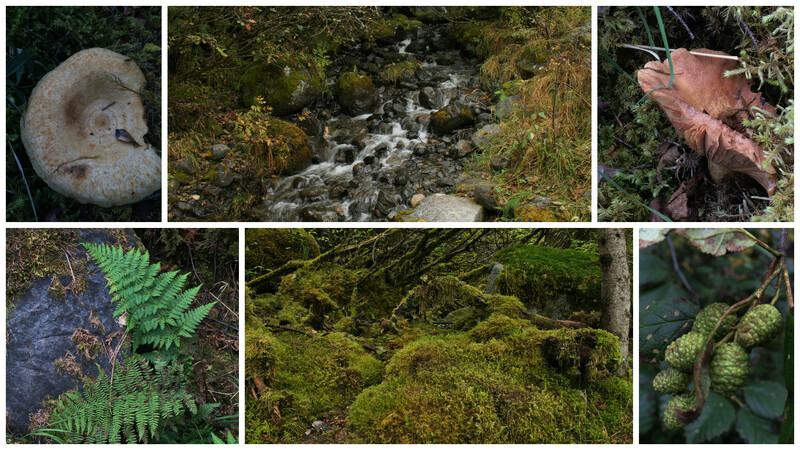 This is such an amazing park, we wish we had a few more days to explore, we may have to come back. You can thank Charles Sheldon for this park, he came here in 1908 and dreamed of this land being preserved and protected. It took almost 10-years of campaigning for his dream to come true. In February 1917, President Woodrow Wilson signed this park into law. At the time it was called Mount McKinley National Park, named after William McKinley who was running for office at the time. By the way, he never once came to Alaska. 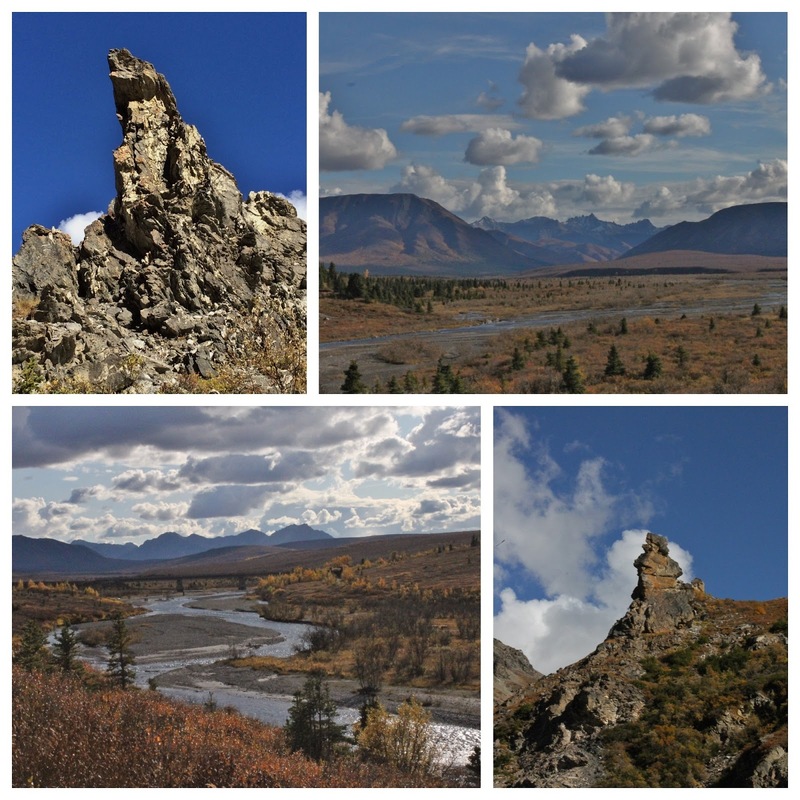 This was the first national park created after the creation of the National Park Service in August 1916. 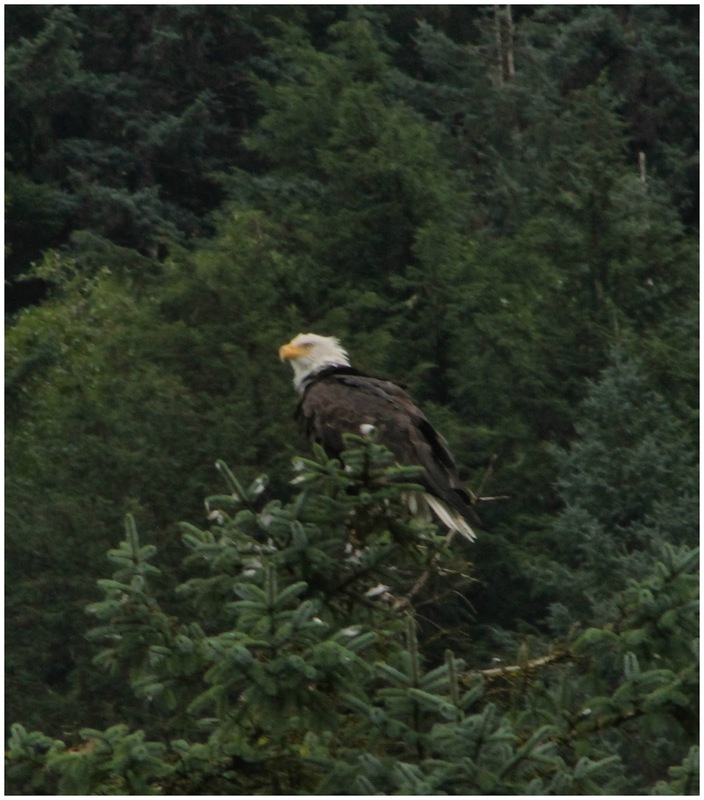 Jump ahead to 1980 when President Jimmy Carter signed into law legislation that established over 100 million acres of new national parks, preserves and wildlife refuges in Alaska. 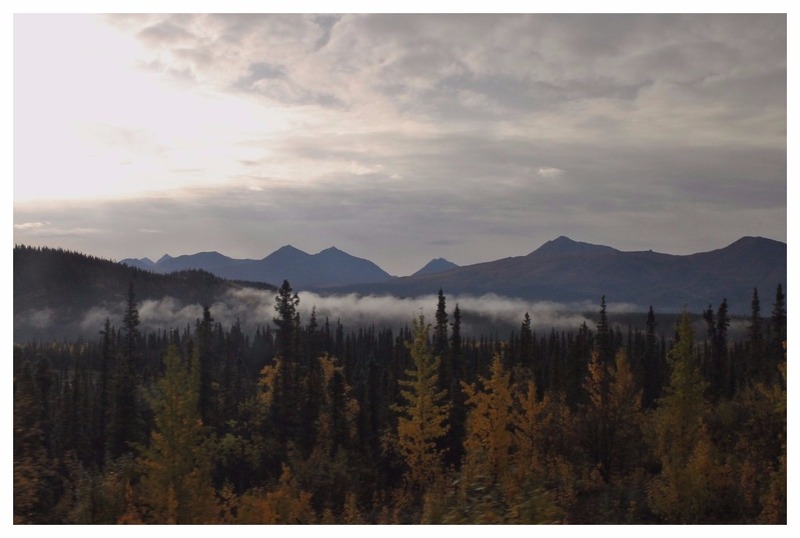 Mount McKinley National Park grew from 2-million acres to 6-million acres and became the Denali National Park and Preserve. Denali means "the High One" to the Athabascan Indians of the north Alaskan Range. 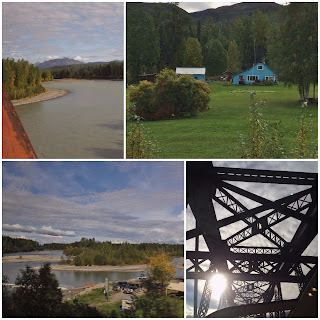 On September 9 we boarded a train in Denali National Park that took us to Anchorage. 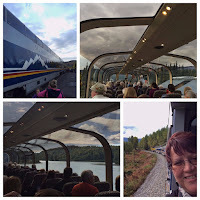 The train has two levels with the dining cars below and the glass topped seating area above that allowed us to see the amazing scenery we were traveling through. 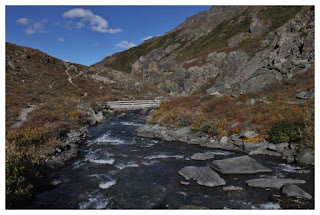 We crossed a number of rivers, at one point bubbles were coming from the engine! 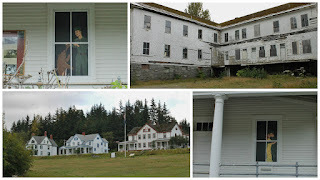 There are a few small towns on the route as well as a couple of homesteads. Mount Denali kept peaking out at us. 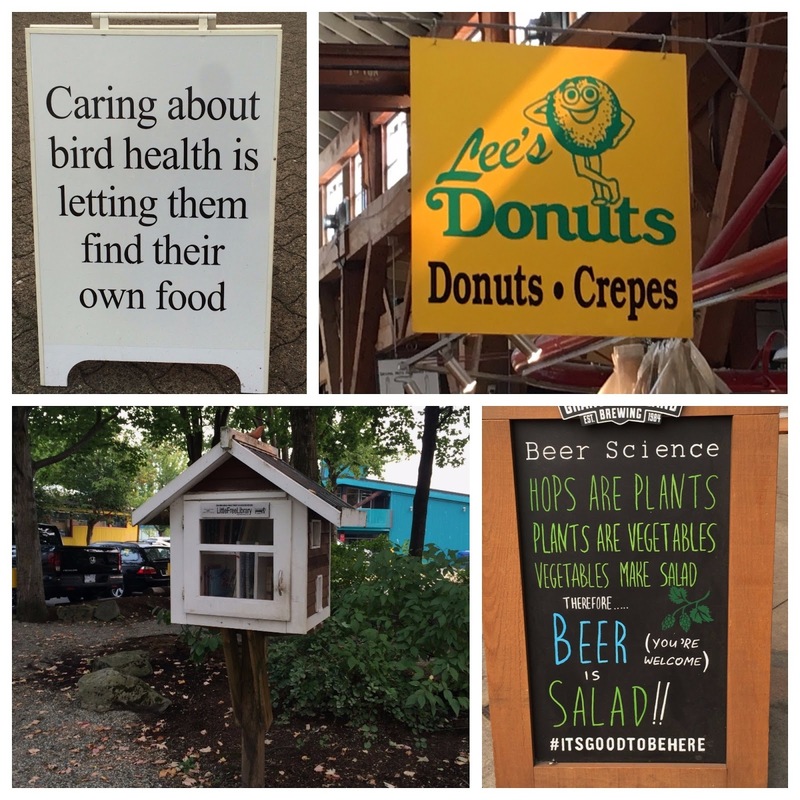 It was a peaceful 5-hour trip where we enjoyed conversation with those around us - from Indiana, Oklahoma and Australia - as well as some reading. 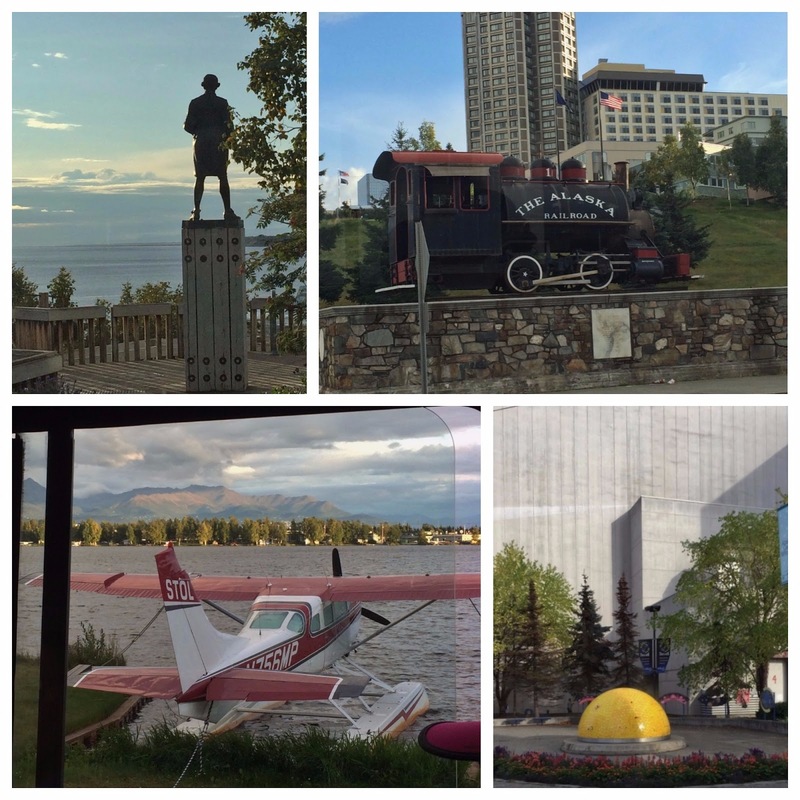 Once we got settled into our room in the Westmark Anchorage hotel, which offered us a wonderful view of the city and the bay, we headed out to catch our trolley tour. 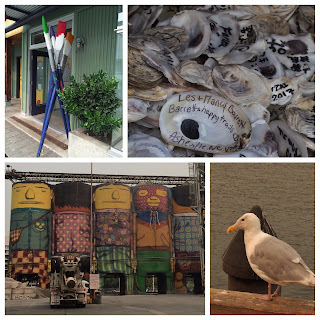 The Anchorage tour reminded us of the LaZoom bus tour in Asheville. Along with learning the history of the city we got a few laughs as well. 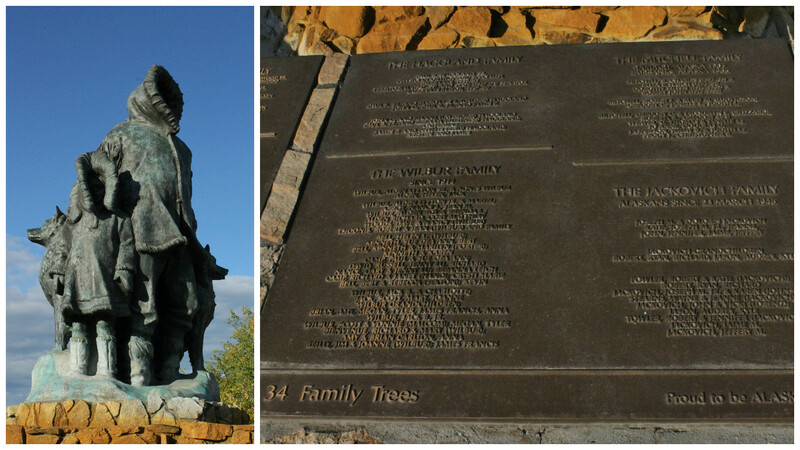 The statue is of Captain Cook set so that he is forever looking out over the water. 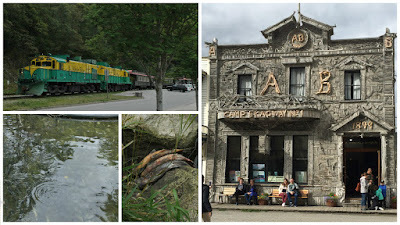 Anchorage was first established as a train camp. 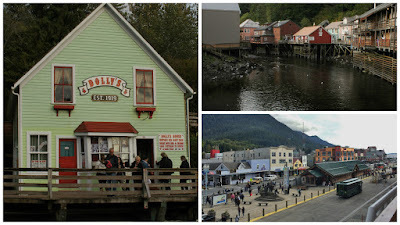 We loved the "dock" for the the seaplanes. Reminded us of Michigan and the houses around the lakes, each one has a boat, but here each one has a plane. The yellow orb is a Roadside Oddity - the Planet Walk Park was designed by a high school student. A leisurely walk around the "sun" mimics the speed of light! 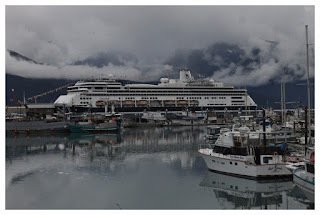 The morning of September 10 we boarded another bus for the trip to Seward where the cruise ship was waiting for us. day it was. Need this in the RV! Once we found our cabin, easy to do with the balloons at the door, we ventured out to explore the town. Edna who arranged our trip surprised us with balloons and champagne. Everyone in our hallway appreciated them as it made it easy to know it was our hallway when getting off the elevators. 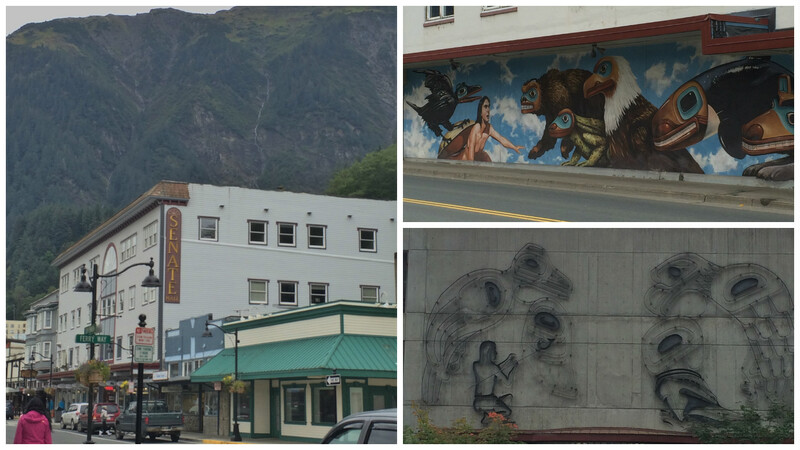 Seward is a small port town, and after days of bus and train rides we were ready for some walking. 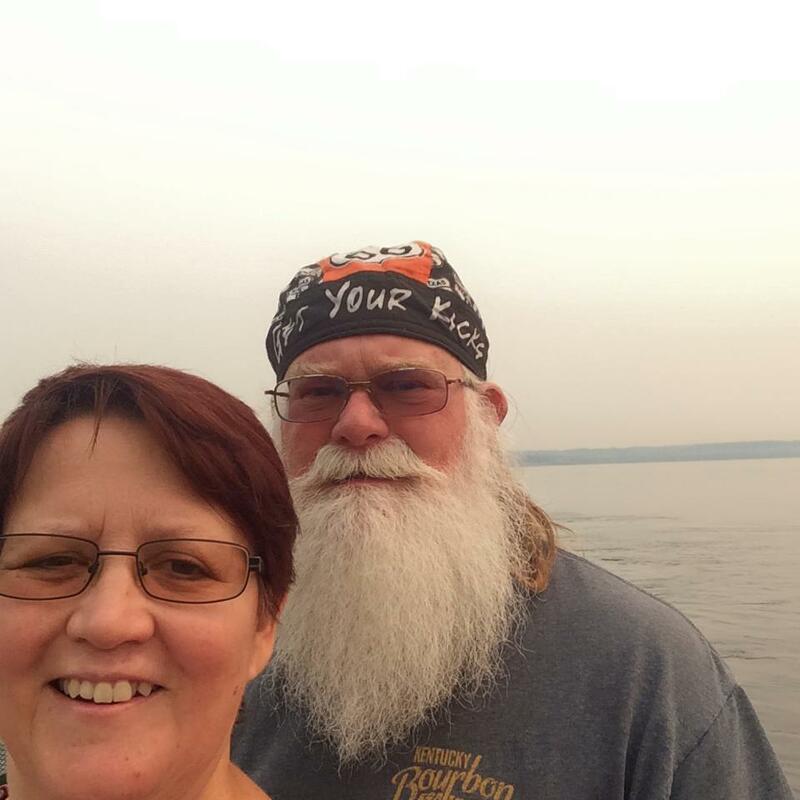 Nancy found a fisherman that reminded her of Les to share an ice cream cone with. 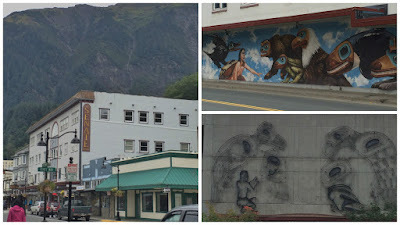 The are a number of murals in town and of course it is surrounded by mountains. At 8:00 pm the Zaandam from the Holland Cruise Line pulled out. 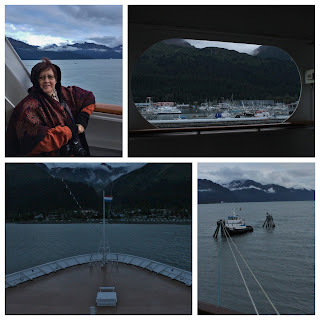 We stayed on deck to watch the departure and yes it was a little chilly. Finally at sea! read our books and enjoyed coffee while watching the ever changing scenery we were passing. Nancy loved the crossword puzzle tables. 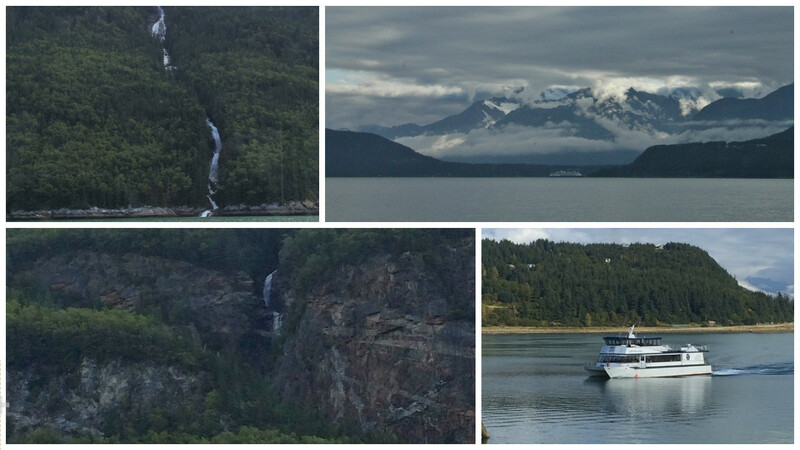 On the 12th we cruised through Glacier Bay National Park. 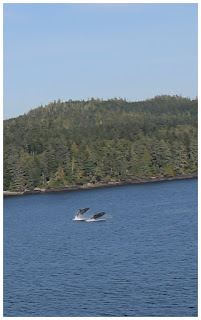 Park rangers were brought on board and spoke over the loud speakers describing what we were seeing. 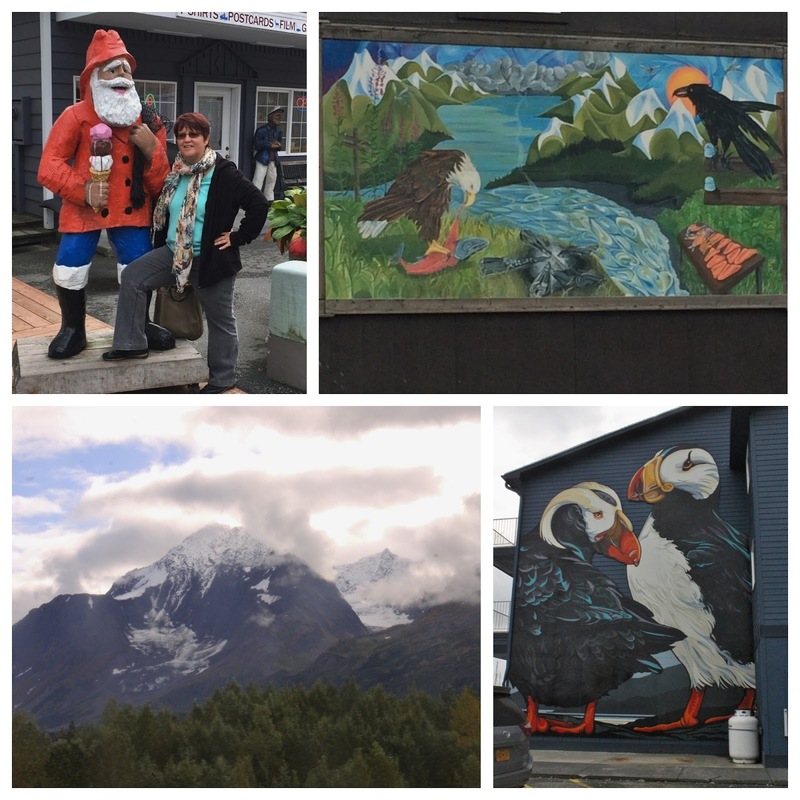 Plus there was an Alaskan Native Culture Guide who presented "Native Voices of Glacier Bay". Sharing stories of his childhood and family. 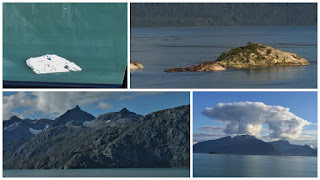 Once we reached the glaciers the boat stopped and then did a very slow one hour turn so you could see the sights from any where on the ship. 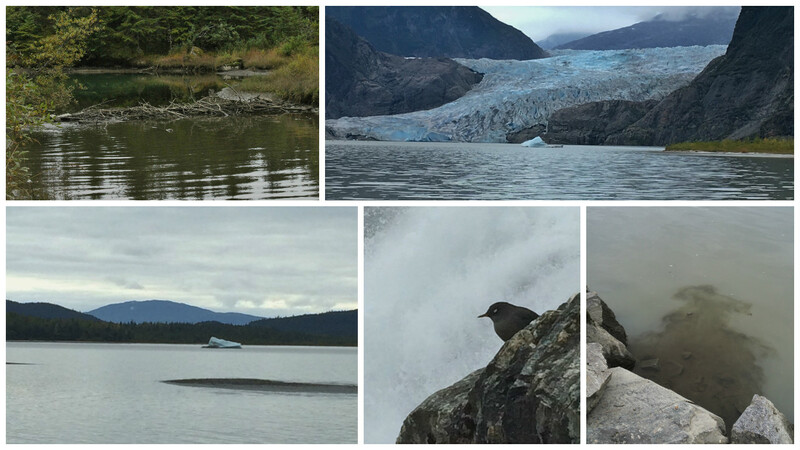 In 1925, after many many years of battle starting with John Muir in the late 1800's and continuing with William Cooper into the early 1900's, Glacier Bay became a National Monument. In 1980 thanks to President Carter it became a National Park. 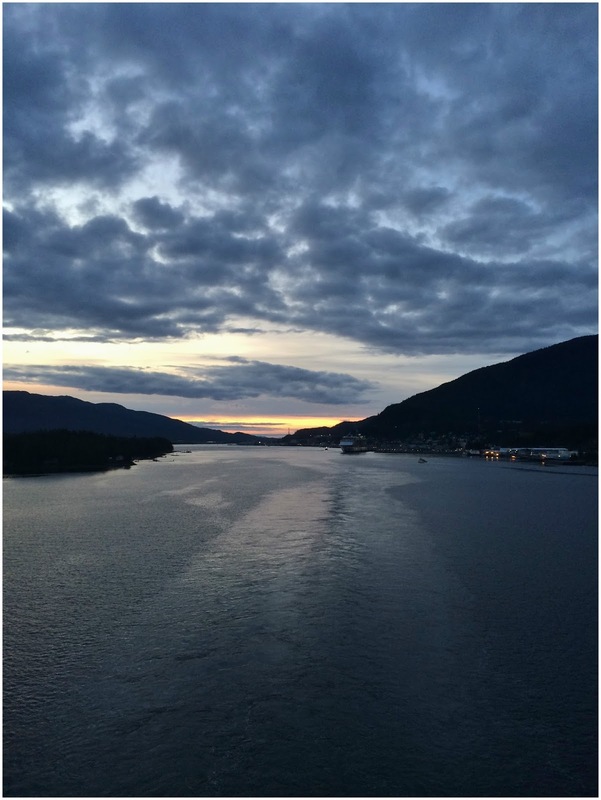 The park covers over 3.2 million acres of forest, shore and inlet. 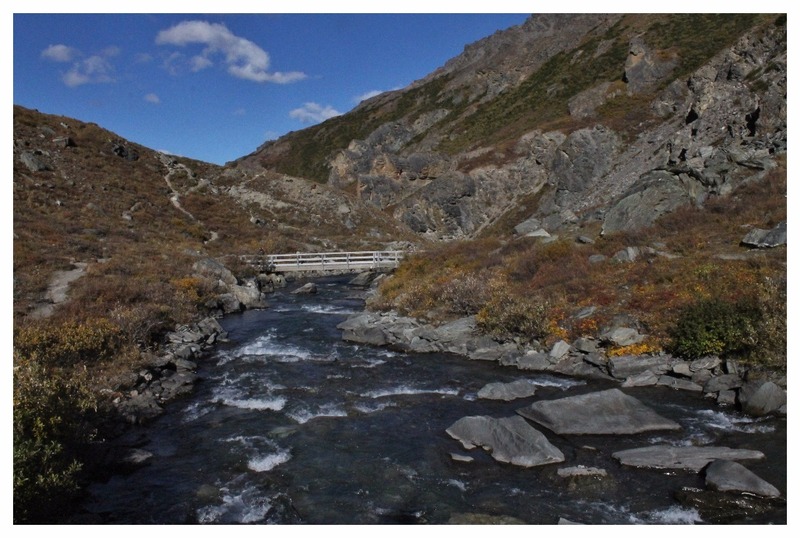 It is the only National Park that includes a full waterway. Of course the glaciers, of which there are seven, are the big attraction. 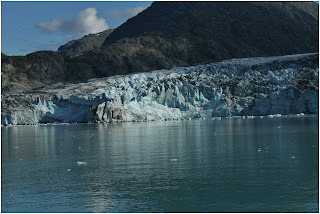 Margerie Glacier is the largest and one of the most active in Alaska. It is about one mile wide and the ice face is about 250-feet high above the water and 100-feet below the water. The glaciers are blue in color due to the light reflecting back through the ice. Much of Glacier Bay is over 1,000-feet deep. We also were able to see the Grand Pacific Glacier, the face of the glacier is "dirty" due to avalanches and rock slides that has caused an accumulation of dirt and rock to be trapped in the ice. Our first port of call was in Haines/Skegway. 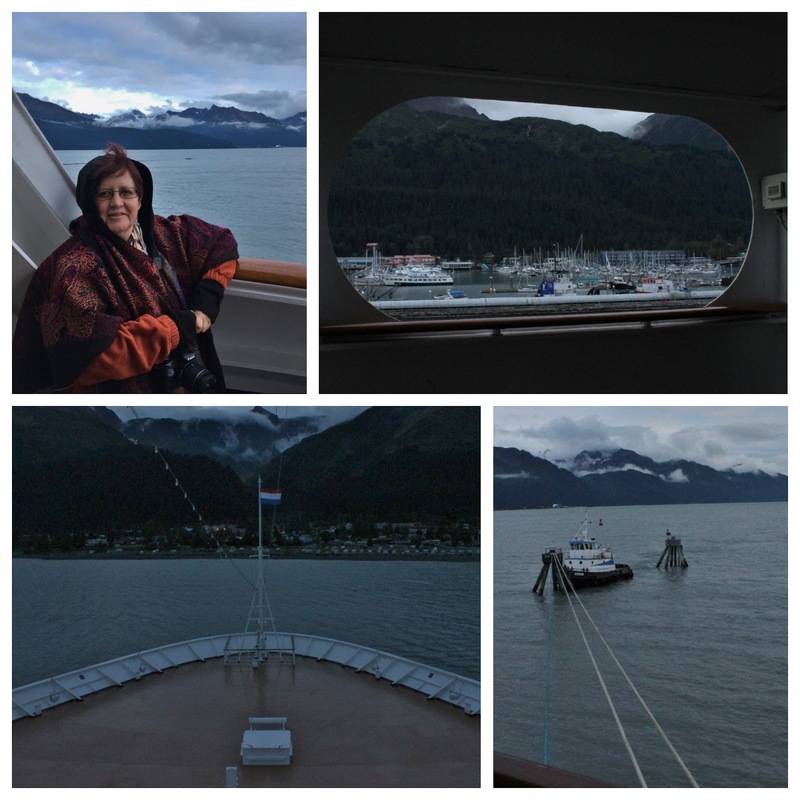 We docked in Haines and then had to take a ferry to Skegway - you could drive if you wanted to take a 350-mile trip! This was one of the frustrating things of the trip. 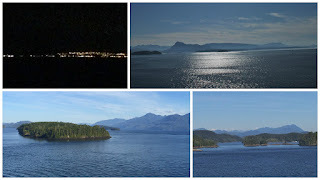 The 45-minute ferry ride cost $72.00 per person, and there was never any mention of this prior to the stop. There is docking in Skegway but there was already three ships there so we had to dock in Haines. 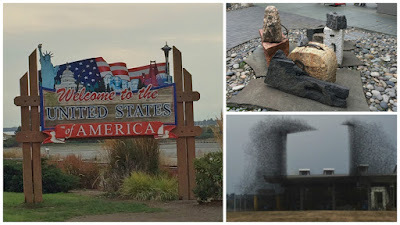 Seeing we didn't want to drive 350-miles we forked over $144 for the ferry. It was a pretty ride with lots of mountains and a few waterfalls to see along the way. 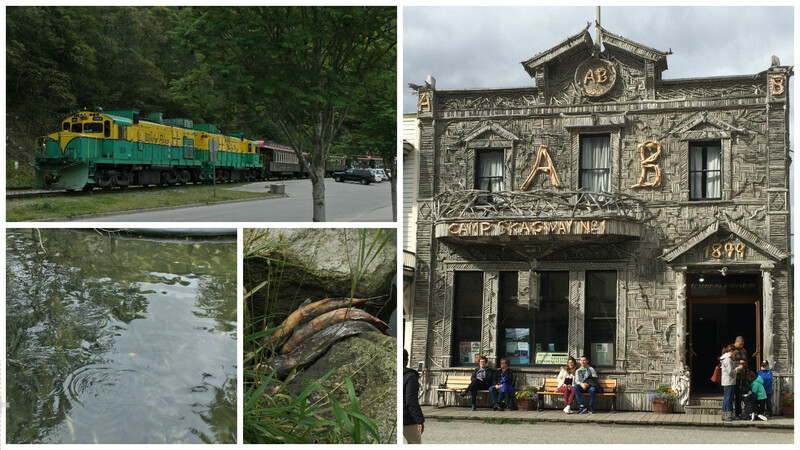 Skagway is a cute little town with all of the shops and restaurants located in the original buildings from the gold rush days. It does seem like kind of a gold rush is still going on as the majority of stores are filled with jewelry ranging in price from $10 to millions of dollars. We did splurge on an Ammolite necklace for Nancy. Yes, Nancy actually bought some real jewelry - not a norm for her. The process was actually fun as both of us love to negotiate for a good deal. The end of the salmon run was still happening and we found a pond in town filled with jumping salmon and those that laid their final eggs. 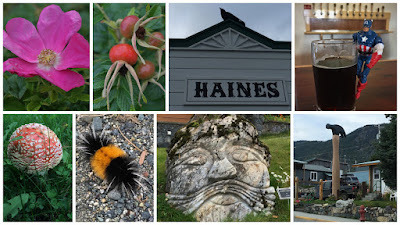 While Haines is not nearly as busy as Skagway it still has a lot to offer. 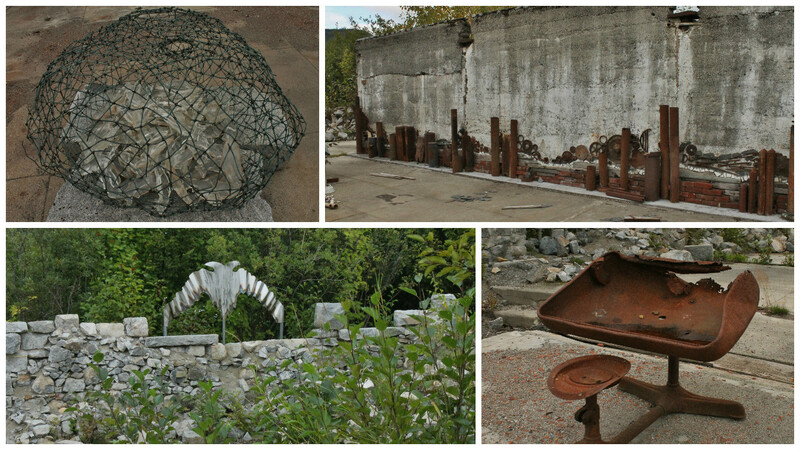 There is the historic Fort William H. Sweard to explore, plus they are building a sculpture garden. 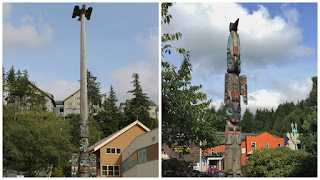 We found flowers, mushrooms, bugs, totem poles and roadside oddities. The Haines Brewery was a nice stop at the end of a busy day. Great beer and wonderful conversation with the owner who even shared a rare small batch with us. It pays off when they found out you know quite a bit about craft beer. While taking the picture of the Woolly Bear Caterpillar a couple from the cruise walked by and commented that they have a lot of them back home. 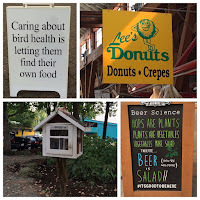 We asked where home was and to our surprise they said Asheville, NC. Come to find out she lived in the same complex that we lived in just prior to our moving there - they still live in Haw Creek Valley. What a small world. 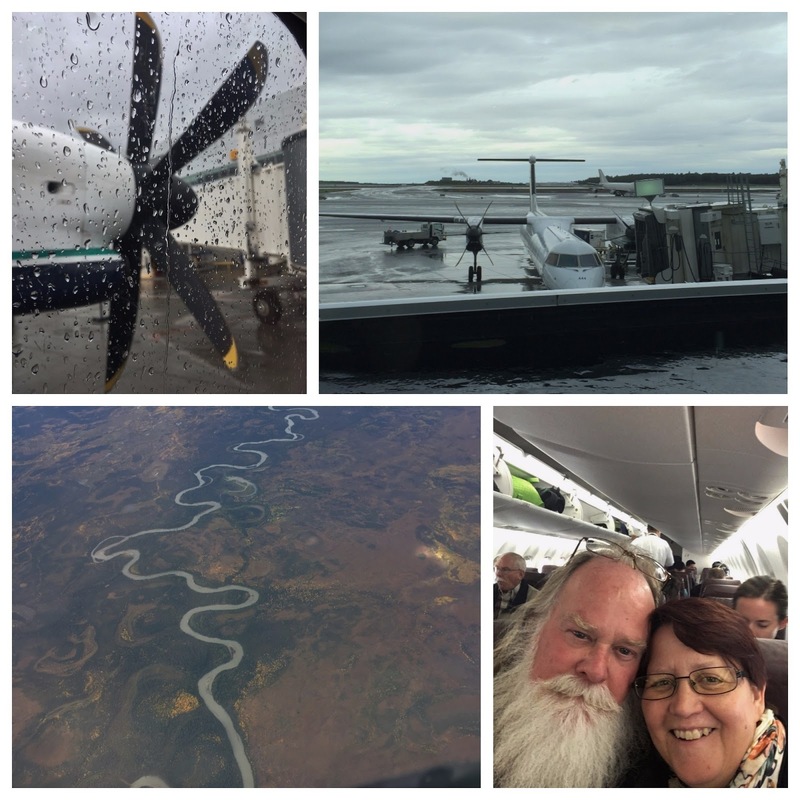 On September 14 we landed in Juneau, the state capitol. The only access to the city is by water or plane. Once again the town is filled with shops and restaurants and it has a beautiful mountain backdrop. 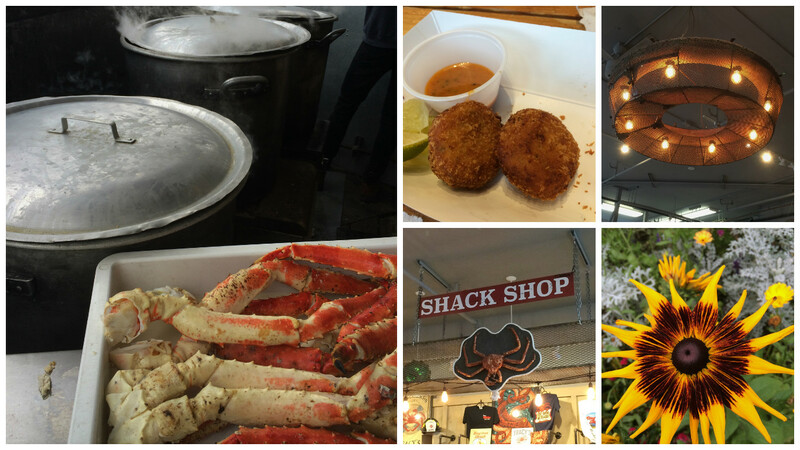 We explored the shops and ate some local seafood. Our day trip was to the Mendenhall Glacier, which is in the Tongass National Forest. 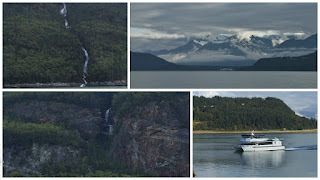 Once there we hiked out to the shores of Mendenhall Lake and the base of the powerful Nugget Falls. moose hat! Yes it is quite ridiculous but oh so much fun! 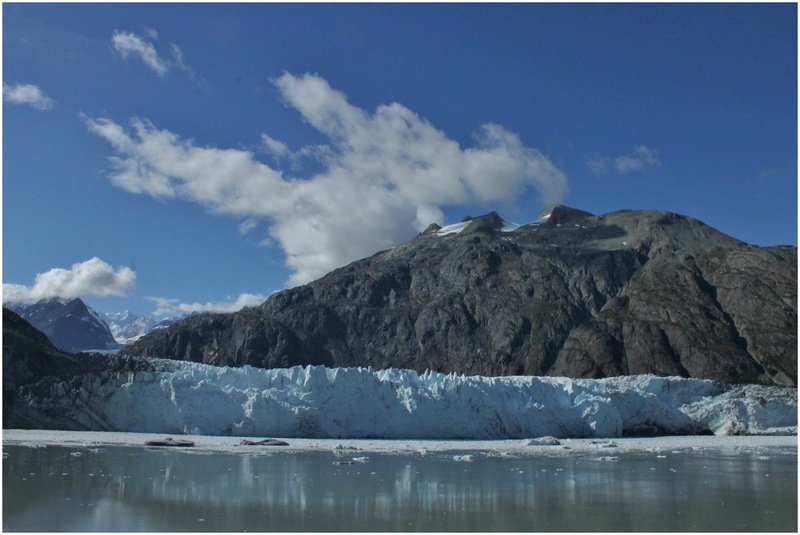 The Glacier is one of 38 glaciers that flow from the 1500-square mile Juneau Icefield. 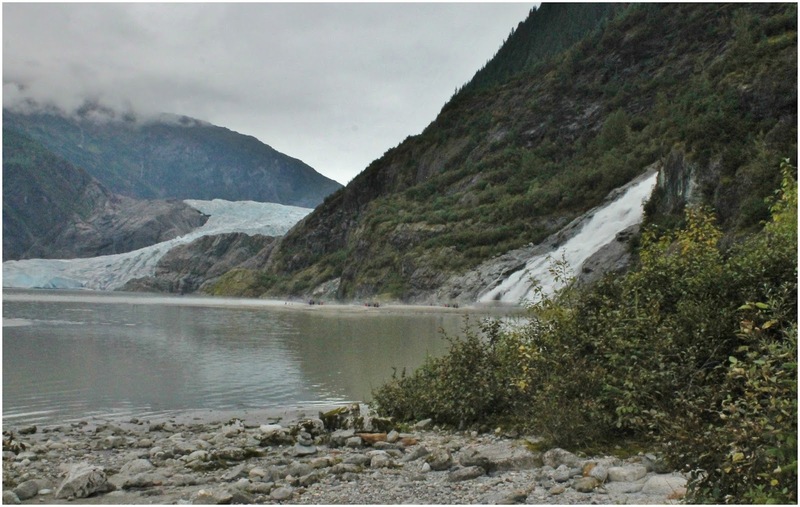 The glacier is roughly 13.6 miles long and is receding at a rapid rate. Standing on the shore, which once was covered by ice and seeing this magnificent creation and hearing the roar of the waterfall was a very humbling experience. 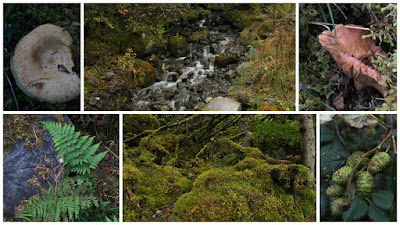 Along the path we found ferns, moss, mushrooms and small waterfalls. There was also ice floats and beaver dams. 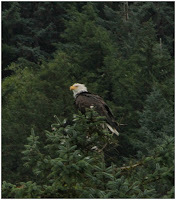 In spots you could see the glacier silt entering the lake and this bird was enjoying the spray from the falls. Ketchikan on September 15 was a really fun stop and our last port of call. 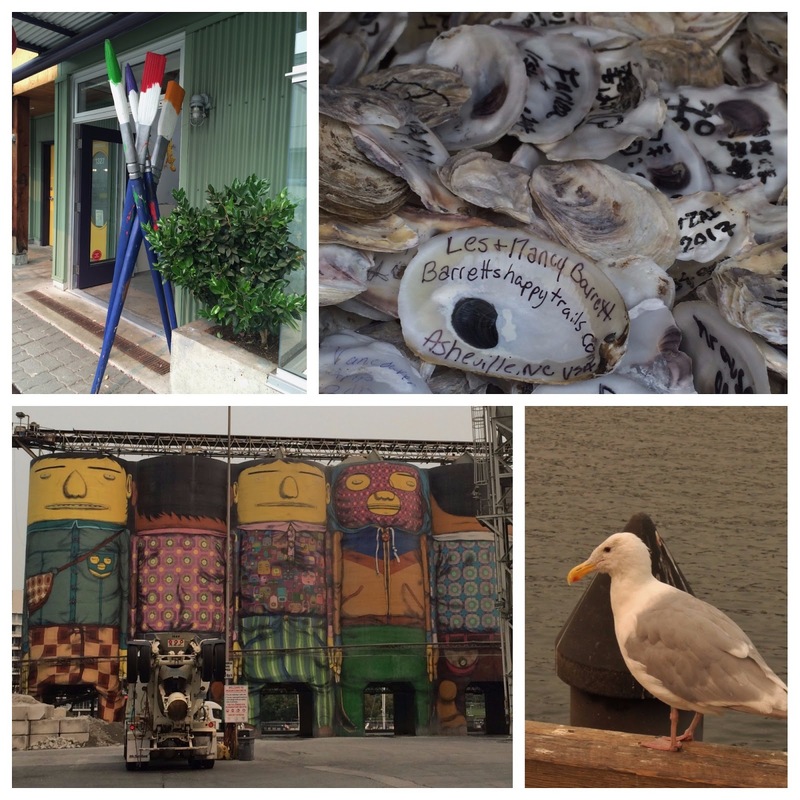 All the activity is right at the port and again a small enough town to walk all of it. We found some Christmas gifts and loved the Happy Trail sign at the coffee shop. There is a lovely walkway along the river lined with historic buildings, including the original brothel. 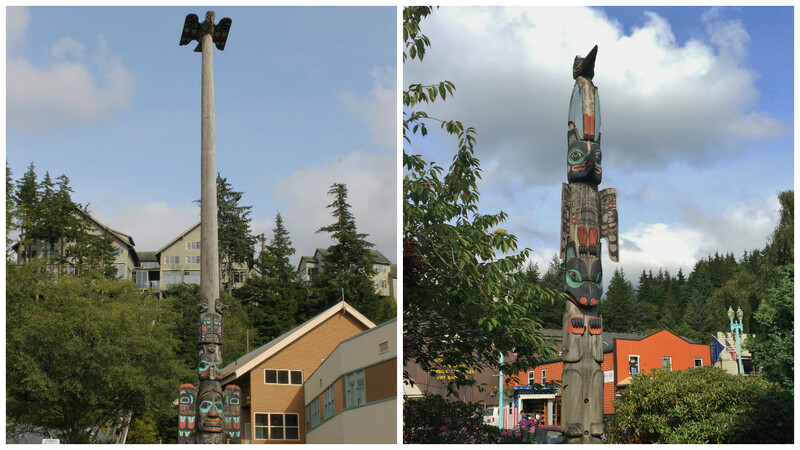 Once again Totem Poles were stationed throughout the town. The sun was setting as we headed back out to sea. 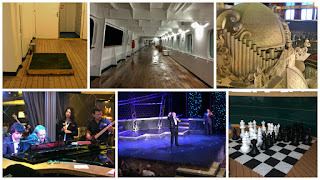 September 16 was our last day on the ship and was spent at sea. We took advantage of the down time and borrowed a few movies to watch and enjoyed the scenery of the Inside Passage. 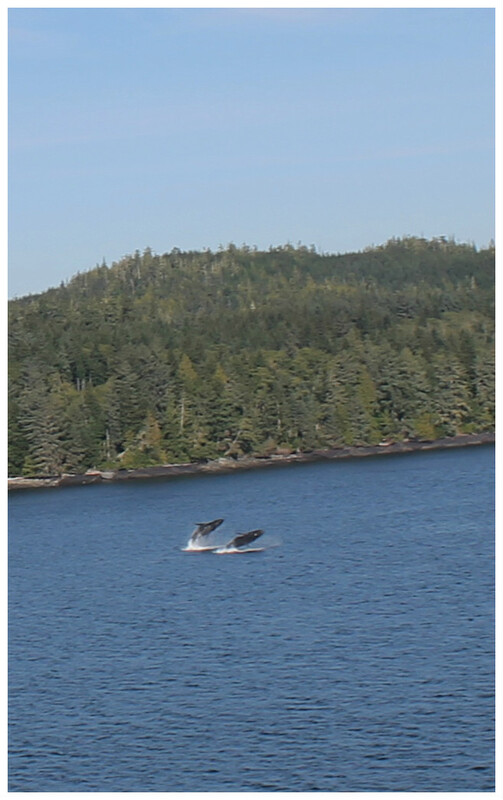 While on deck we spotted some whales off in the distance and sea otters chasing each other. On the morning of September 17 we pulled into the docks in Vancouver, BC. We now know how they load the ship up with all the goodies they fed us. What a grand adventure this was. 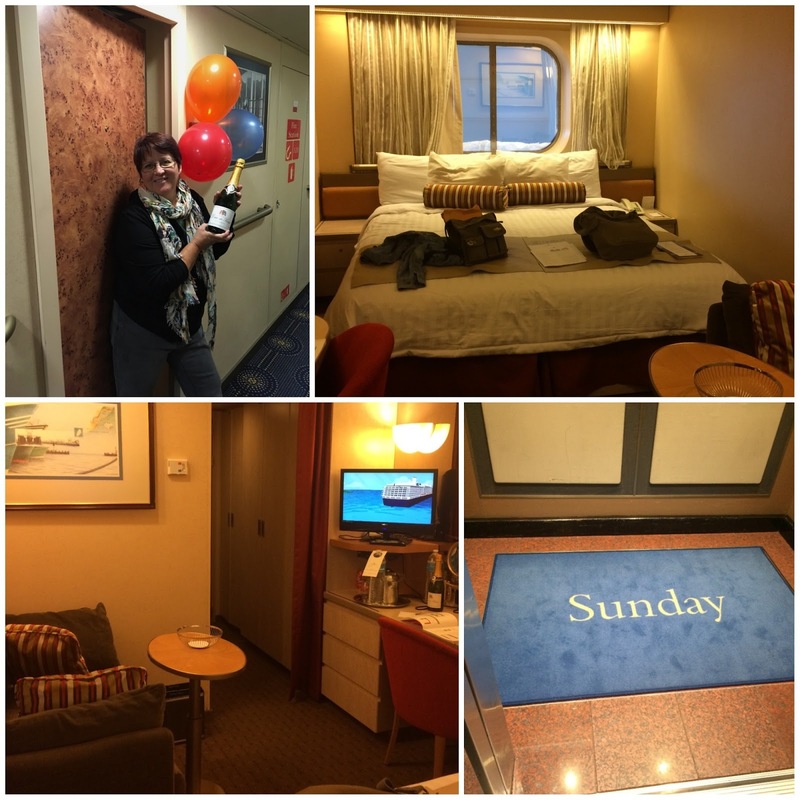 We enjoyed our first cruise - but guessing it may be our first and last. 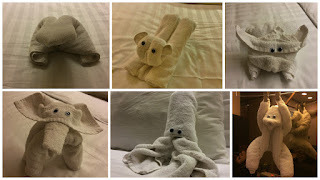 While there are a number of activities on board and plenty of time to relax, we found ourselves a little bored on the "at sea days". We enjoyed all of the nightly entertainment, and we have missed the delicious food that was available 24 hours a day. 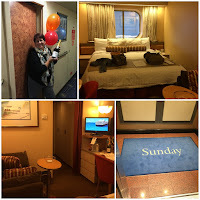 The ship was beautiful, the staff was amazing and they really made the whole thing perfect. 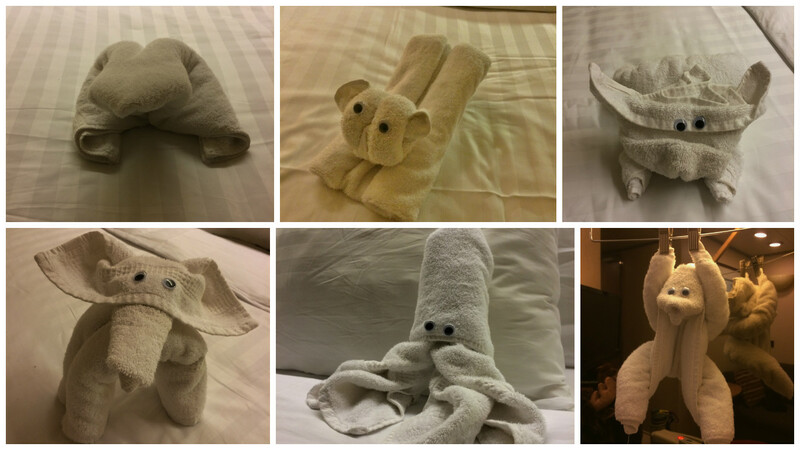 The nightly towel critters were great fun, along with the tasty chocolates that were left for us. The best part was the opportunity to get a little taste of Alaska. This has left us wanting more. We may have to come back again at a later date. We so greatly appreciate Edna Weber Tull for making all of our arrangements for us. Once through customs we boarded a bus to the airport and then a shuttle to the hotel where we left our car and headed back to Seattle. Next up is Oregon and California. 1. Passports - for this cruise going in and out of Canada we needed our passports. It's a good idea to make photo copies of them to keep on you when you go into port and handy if you should lose the originals. We copied both passports onto one sheet and we each carried a copy. 2. Take less - whatever you think you need to pack - we guarantee you will need less than you think. 3. Research - if you are planning your own trip this is a no-brainier. If someone else is planning your trip we suggest you do some research on your own. 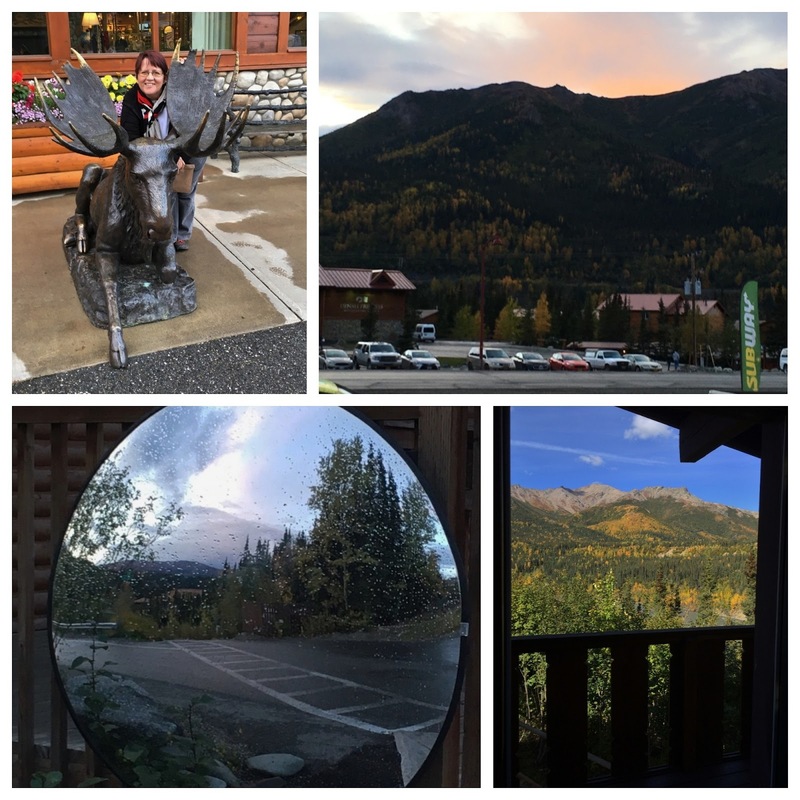 It was such a nice break for us to not have to plan anything for a change - but if we had we probably could have added some extra days and activities onto the trip. 4. Check your phone coverage - we have international coverage on our plan from a previous trip so all we had to do was activate it. While coverage in some of Canada is consider US coverage not all of it is. Better to plan ahead than to be surprised when the next bill comes. 5. Bring postage stamps - if you plan to mail postcards or letters, bring your own stamps. Postcard stamps cost us more than regular postage stamps in one of the towns we stopped in. 6. Money exchange - if your travels will be taking you to a different country find out where you can exchange money for the best price. 7. Check flight costs - Check the cost of flights from various places to see if there is a savings. 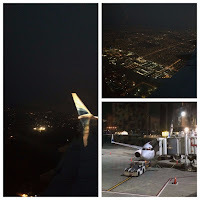 Our flying out of Vancouver, BC saved us a lot of money. 8. Don't sweat the small stuff - there will always be things that don't go according to the plan or just the way you would want them to go. It can be easy to let this ruin your vacation but don't let it. In the big picture of what you are seeing and doing - it really is just a very small piece. We had a few glitches but over all they were nothing compared to everything else we experienced.